It had been a while since I went for a long ride and nothing seemed like a better time than the 3 day weekend of 15-17 August (2014). Earlier I was planning to ride to Horsely Hills, Andhra Pradesh which is like 270 km from Chennai. But someone told me that it’s not worth going alone so I dropped that idea. So I posted in KTM 390 Facebook group if any of them was riding this weekend. 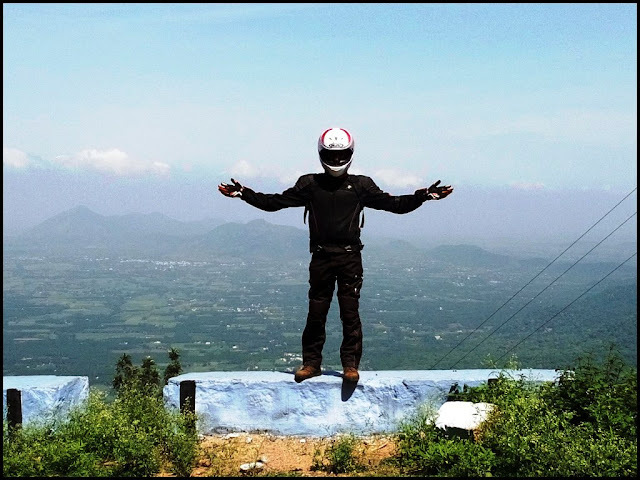 One of guys(Dhannan) replied that he was riding to Kolli Hills. I immediately googled about it and found that it’s a beautiful place. What immediately sparked excitement in me was the fact that it had 70 hairpin bends! Then I started imagining myself leaning around the bends hehehhe. 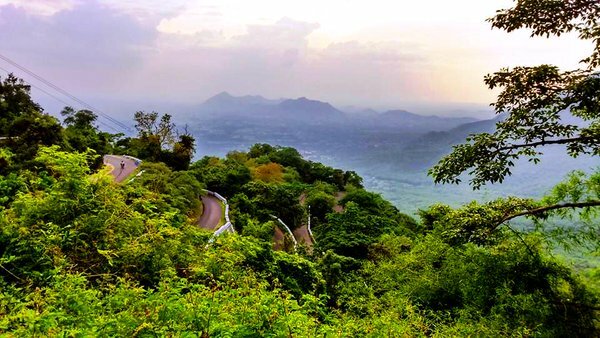 According to Wikipedia, Kolli hills is a small mountain range located in central Tamil Nadu in Namakkal district of India. The mountains are about 1300 m in height and cover an area of approximately 280 km². The Kolli Hills has 70 hair pin bends to reach the top of the hills. The Kolli Hills are part of the Eastern Ghats, which is a mountain range that runs mostly parallel to the east coast of South India. The mountains are relatively untouched by commercial tourism and still retain their natural beauty. The Mountain is named Kolli Malai behind the name of Goddess Ettukkai Amman(KolliPaavai).The Goddess has been guarding the hills from evils and the same is believed even now. So I woke up early on 15th August and met Dhannan at Vandalur. I was not surprised to see the road full of cars and bikers even at 5am ! Guess everybody had their plans to escape from Chennai this weekend. The place I waited seemed like a regular meeting point for bikers. Spotted few RE riders, a Yezdi group and a Triumph Bonneville, FZ1, Triumph Street Triple, and few Harleys waiting for assembly. Dhannan came at 6:10am and we started riding at 6:15 am. 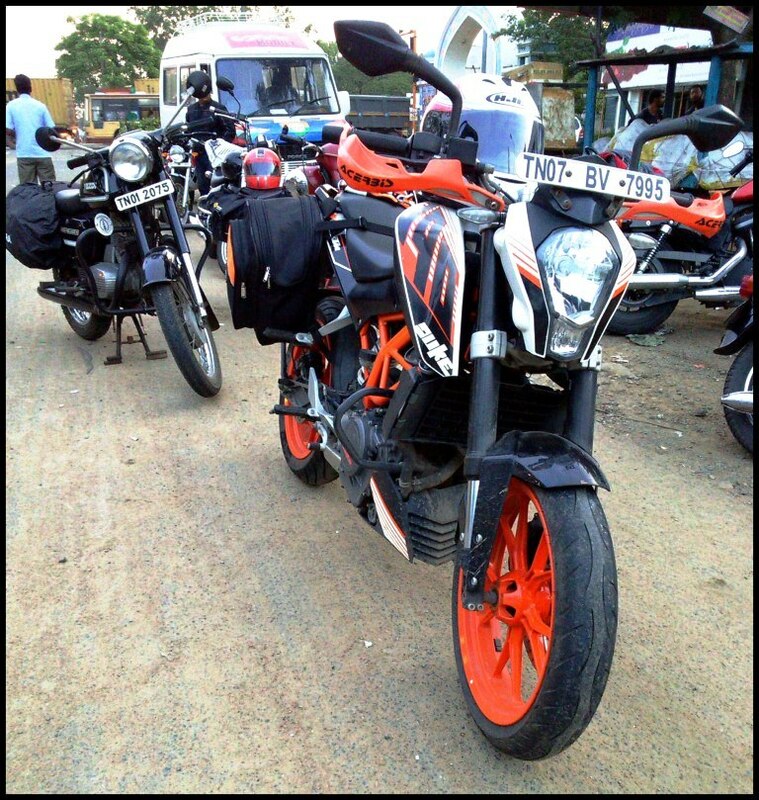 After riding for about 190km, at 8:00am we reached Villupuram highway and decided to have breakfast. We were doing good speeds of 120-130kmph. Two stops for petrol during the ride as we were riding fast and one full tank gave us about 210km to ride. We had lot of time so we decided to take some pics on the road. Because both of us felt that when you are riding solo there is no one to take pics haha. I have never had so much fun riding up hills. 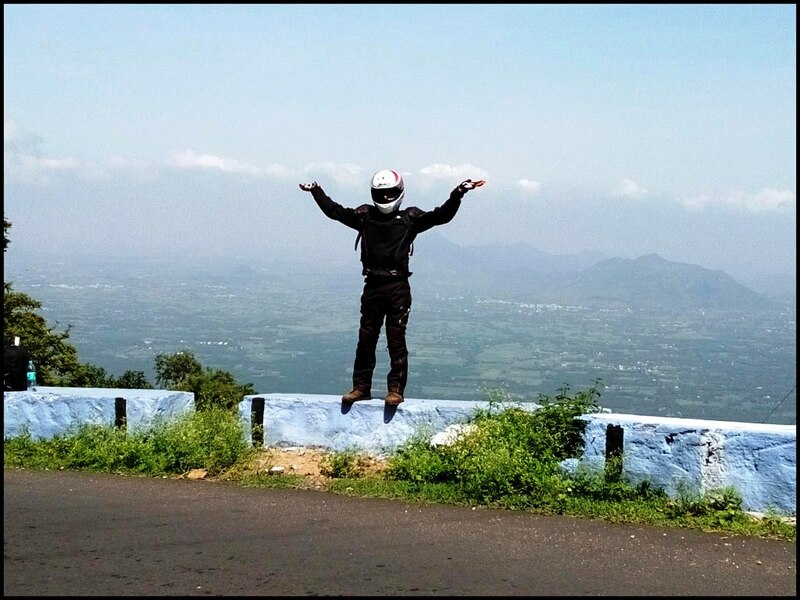 I had changed the rear tyre just a day before this ride so I had full confidence in leaning around the bends. The experience can’t be explained in words. With every bend you take in the right line, it’s just the feeling of winning and happiness. 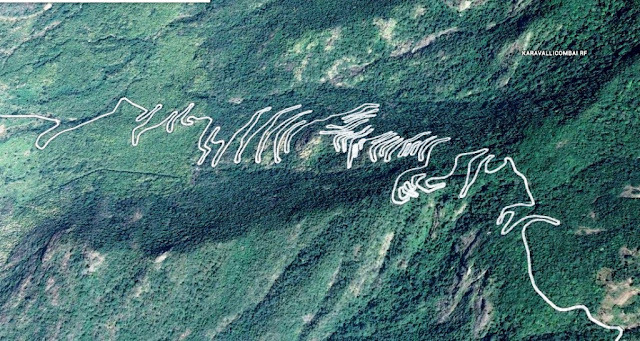 Apart from the 70 hairpin bends, the road in general was full of curves. Sadly you can’t stop at every bend to take pictures because you have to continue riding. Although I really wish there was some invisible angel photographer with every rider who could click pictures anytime the rider wanted. We reached Kolli Hills top at around 5:15pm and started looking for a place to spend the night. Here we faced our bad luck. All the rooms in all the lodges/resorts were booked. Luckily we got a room at one place but it was very shady, but we did not have any option. There were people searching for room in their cars at 7-8pm. We had an early dinner and went to sleep as we had to wake up early next day. From there we had to go to see a waterfall. I forgot the name of the water falls and I felt that water was somewhat less than I had seen in the pictures online. But it was great to be here. After we were done with the water fall, we still had plenty of time so we decided to take more pictures around. Plenty of greenery around is pleasing enough. So after our photo sessions we decided to head back to the lodge. We geared up and at 11 am we started back to Namakkal from the lodge and reached there at 12:00 noon. Took rest for some time and left at 12:30 from Namakkal as we had to reach Chennai as early as possible before it got dark. We decided to ride a little fast. At 2:00pm about 25km from Villupuram we stopped for lunch. After the lunch we kept varying our speeds , overtaking each other, riding slow, riding fast otherwise it could get a little boring. So you have to play games like these to keep the fun alive :P. Although this highway was such a welcome change from the boring Chennai-Bangalore highway. At 4:30pm we were entering Chennai and faced traffic jams near Vandalur. Crossing that I faced another traffic jam at Adyar, tried my best to find my way between the traffic and finally I was home at 5:00pm. 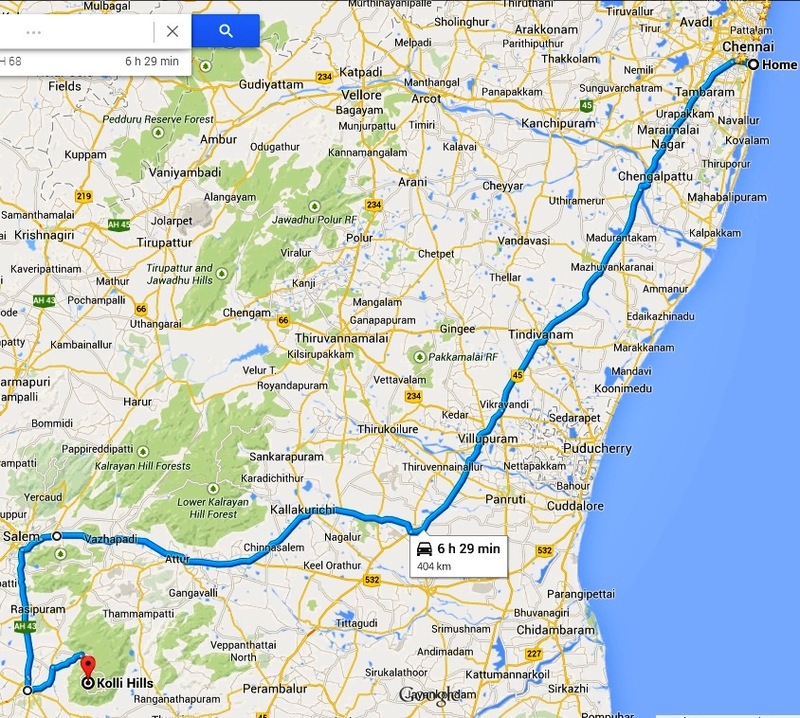 feeling satisfied with the time we did to reach Chennai. It was absolutely amazing to ride with Dhannan. He knew that we had to keep up the speeds and he knew his lines. Always wanted to ride right behind a wheel doing such high speeds, and it’s a great feeling and gives such a rush to your adrenaline. I conveyed this to him and thanked him for letting me ride with him. :)......seems like ure having fun... enjoy!!!!! The testing procedure includes a high effect circumstance, up to 400 g, in which a spurious head is set in a cap, and after that dropped from a safely helmet tallness of around 10 to 15 feet, which is the stature that mimics most occasions in a run of the mill mishap circumstance. When you are out riding on trails, there is a right way-and a wrong approach to go down hills. Likewise with numerous aptitudes in riding, the way to effectively and securely exploring slopes is great equalization. So you need to ride a bike? This article will address the correct riding strategies and tips and will give you the base data on what you'll have to know on beginning to ride a bike.